With population and consumption growing rapidly, for the planet to be able to sustain the need for food, fuel, fibres and other raw materials a more sustainable way is needed for producing these commodities. In response to this growing concern in 2009, the World Wide Fund for Nature (WWF) launched its Market Transformation Initiative (MTI), aimed at more sustainable production and trade of “soft” commodities. The MTI focuses on fifteen commodities with the greatest impacts on biodiversity, water and climate, particularly in the most important places for conservation. The overall objective of the MTI is for 25% of the global production of WWF’s fifteen priority commodities to be meeting credible standards by 2020. 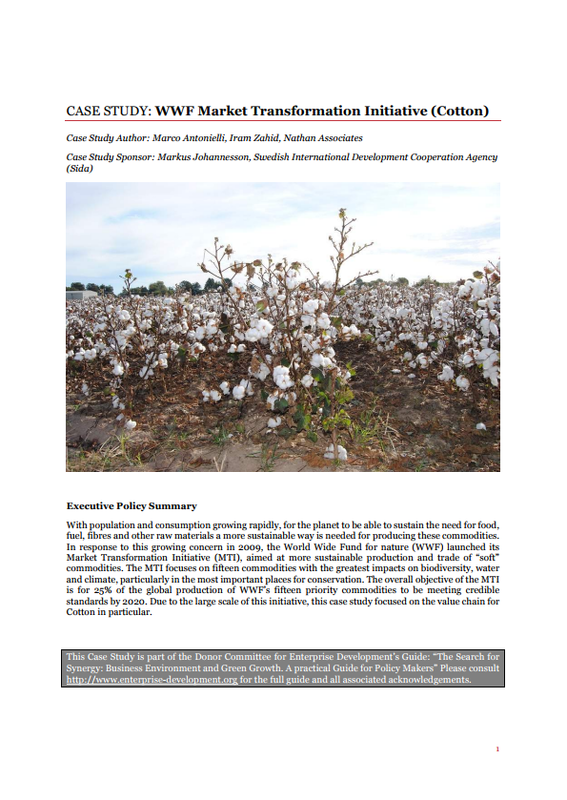 Due to the large scale of this initiative, the case study WWF Market Transformation Initiative (Cotton) focused on the value chain for Cotton in particular. The main route through which changes have been made in the cotton value chain is through the Better Cotton Initiative (BCI), which was formed as part of a roundtable with representatives from NGOs, academia, governments and industry. The main approach used by the BCI was voluntary certification. The Eco-Agricultural Business for the Adaptation to Changes in Climate (B-ADAPT) project sought to enhance and diversify income and food security among vulnerable populations of southern Cameroon. The case study Macroeconomic Reform in Viet Nam on Ecological and Inclusive Growth looks specifically at the Green Growth Strategy of Vietnam, approved in 2012, with the threefold aim of promoting low carbon growth, greening production and greening lifestyles.